An early goal from Manchester City seemed to have ended the game before it even began, until Arsenal struck back from a set piece. The match hung in the balance before Agüero grabbed his second, right before half-time. That goal kicked City into another gear and they easily secured their victory over the next forty-five minutes. Tactical analysis and match report by Om Arvind. 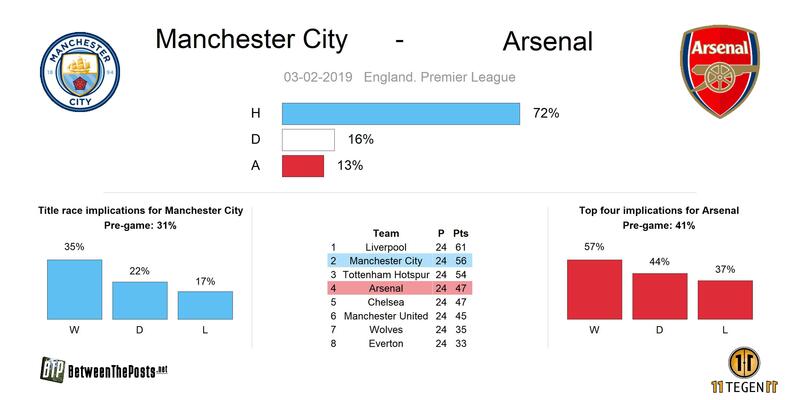 It feels like we’re going to be saying this a lot from here on out, but today’s match-up between Manchester City and Arsenal really was a crucial encounter in the context of the Premier League’s top six. After dropping points to Newcastle midweek, Pep Guardiola’s side sat five points behind league leaders Liverpool, meaning that City could not afford another loss. Arsenal also needed a result as they had been knocked out of the top five by a thrilling run from Ole Gunnar Solskjær’s Manchester United. Prior to this game, Unai Emery’s men sat one point behind United and three off Chelsea. Match prediction, standings and implications going into the weekend. Despite the high stakes, Pep Guardiola – who has a track record of throwing surprises in big games – decided to pick a lineup that confused many people. He selected two center backs in Aymeric Laporte and Nicolás Otamendi, one fullback in Kyle Walker, four central midfielders in İlkay Gündoğan, Fernandinho, David Silva, and Kevin De Bruyne, two wingers in Raheem Sterling and Bernardo Silva, and one striker in Sergio Agüero (Ederson, of course, was the goalkeeper). Unai Emery’s team selection was easier to grasp. Pierre-Emerick Aubameyang and Alexandre Lacazette spearheaded a 4-4-2 formation, ahead of a midfield unsurprisingly missing Mesut Özil for ‘tactical reasons’. Perhaps the only real surprise was the presence of natural left back Sead Kolašinac in an attacking position, who was placed upfield to presumably make the team more secure defensively. Former champions always have to invent, adapt, and switch things up if they wish to stay relevant, and Manchester City have tried to do just that following their all-time great 2017/18 campaign. The return of Benjamin Mendy created new fullback variations at the start of the season and the signing of Riyad Mahrez provided competition and allowed Guardiola to fiddle with inverted wingers. However, some things work too well to be changed, placing a difficult conundrum on a coach’s head; what to change and what to keep? The jury is still out on whether Guardiola has managed the perfect balancing act, but it is clear that his decision to maintain David Silva and Kevin De Bruyne’s diagonal runs has been a good one. City’s 3-2-4-1 formation depicted, with most ball progression in vertical direction along the flanks. The benefits of keeping this pattern of play was especially visible in City’s first goal of the match, which occurred in under fifty seconds. Sterling received the ball on the left touchline, attracting right back Stephan Lichtsteiner towards him. With Alex Iwobi closing in, the City winger looked trapped, until David Silva made his move. By executing an ‘in-out’ run from the left halfspace If you divide the field in five vertical lanes, the halfspaces are the lanes that are not on the wing and not in the center. Because there is no touchline like on the wing, players have freedom to go everywhere. But this zone often is not as well-defended as the very center. This makes it a very valuable offensive zone to play in and a lot of chances are created by passes or dribbles from the halfspace. to the wide area ahead of Sterling, Silva was able to dart into space on the blind side If a defender looks one way, an attacker can try to make a run behind his back, on the side where he is not looking. This is called the blind side. of Lichtsteiner. By the time Lichtsteiner turned, Silva had already begun to attack the box. Arsenal managed to block the cross and play it wide to Iwobi, who promptly lost possession on edge of the of the box thanks to City’s counterpressing. After losing possession, a team immediately moves towards the ball as a unit to regain possession, or at least slow down the pace of the counterattack. Laporte took advantage and fed Agüero to make it 1-0. After the very early goal, City’s formation soon became clear. Laporte-Otamendi-Walker formed a back three when they had the ball, with Fernandinho playing next to Gündoğan in a double pivot. 4-2-3-1 is one of the most frequently occurring formations in football. The two most defensive midfielders are called a ‘double pivot’. Sterling-D. Silva-De Bruyne-B. Silva sat ahead of them and behind Agüero, forming a 3-2-4-1 attacking structure. 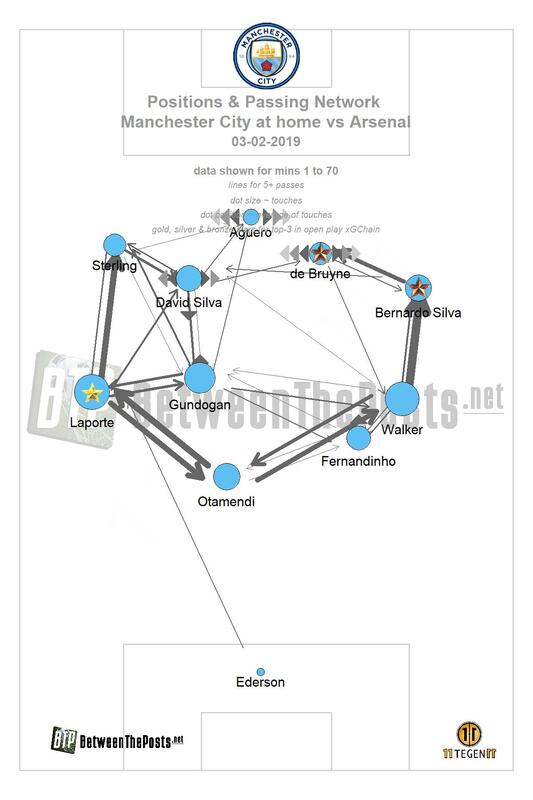 When they lost the ball, Fernandinho quickly joined the defensive line to create a back four and transition City to a 4-1-4-1 shape. Notwithstanding Pep’s tricks, City created few chances after the goal. This was especially curious since the 3-2-4-1 set-up actually outmatched Arsenal’s 4-4-2 defense fairly well. 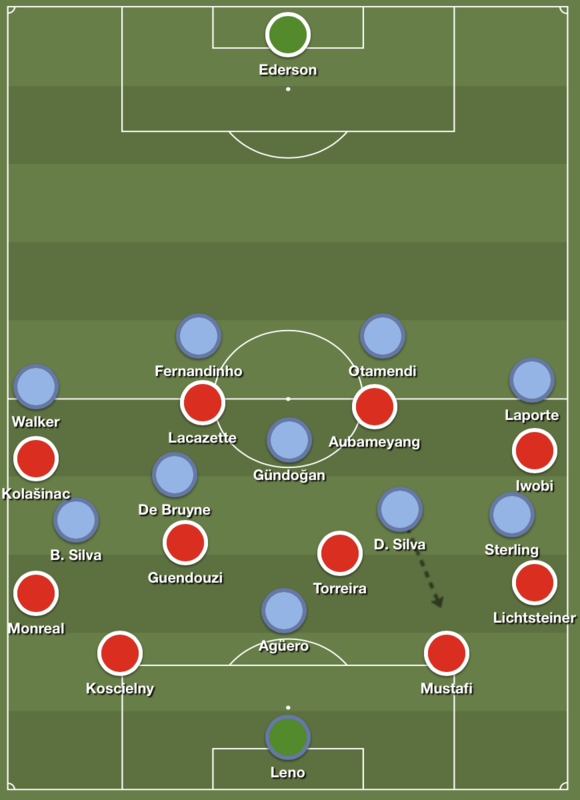 Manchester City’s 3-2-4-1 attack versus Arsenal’s 4-4-2 defense. 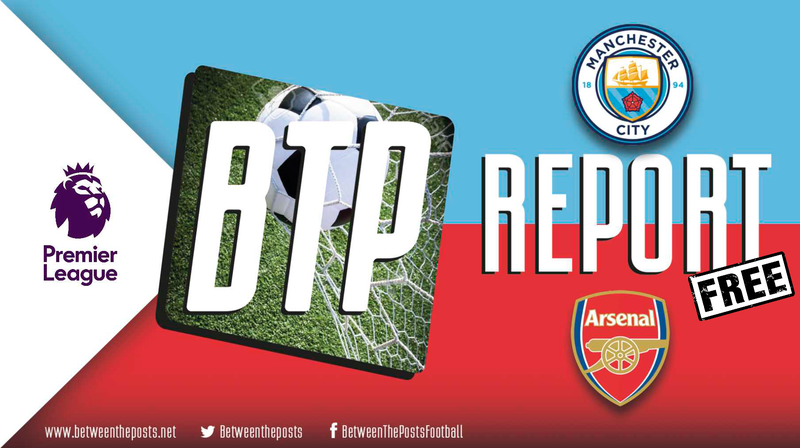 The aggressive positioning of David Silva and De Bruyne forced Arsenal’s fullbacks to narrow, while Agüero’s presence prevented center-backs Shkodran Mustafi and Laurent Koscielny from moving wide to help out. This created the threat of Sterling and Bernardo Silva receiving the ball in lots of space. Iwobi and Kolašinac could have both dropped, but that would have left Walker and Laporte free to aid ball progression. Arsenal dealt with this conundrum by asking the ball side winger to drop, while the far side The far side is the side of the pitch where the ball is not. man would pinch inwards. Sometimes, this far side player – who was mostly Kolašinac – would position himself in line with the strikers to create a three-versus-three of sorts against City’s defense. 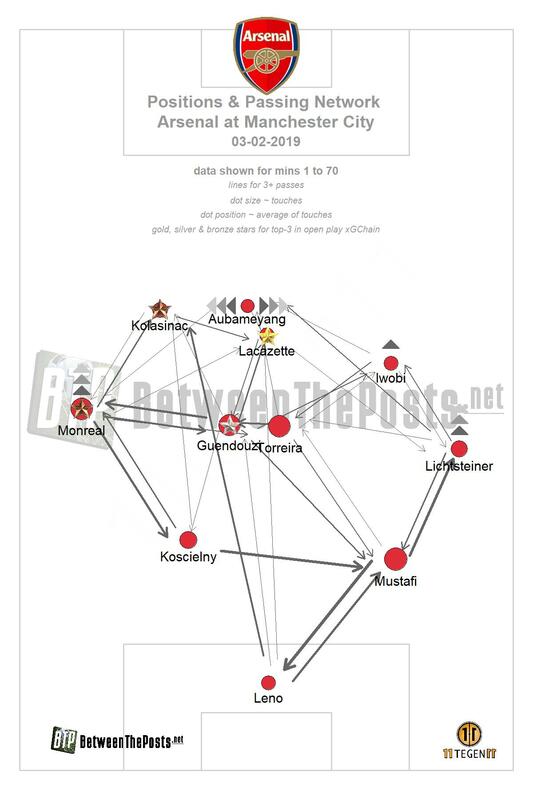 The passmap of Arsenal’s 4-4-2 formation shows Kolašinac’s advanced position on the left wing. As a result, City’s own far side winger – mostly Bernardo Silva – was always free. For whatever reason, Guardiola’s players declined to switch the ball A pass from one side to the other. and focused on trying to find Silva’s and De Bruyne’s diagonal runs. Arsenal, wise to the ploy after conceding, managed to track their runs very well to shut City out. Emery’s team took advantage of City’s offensive lull in the eleventh minute, when they played a direct pass to Aubameyang. 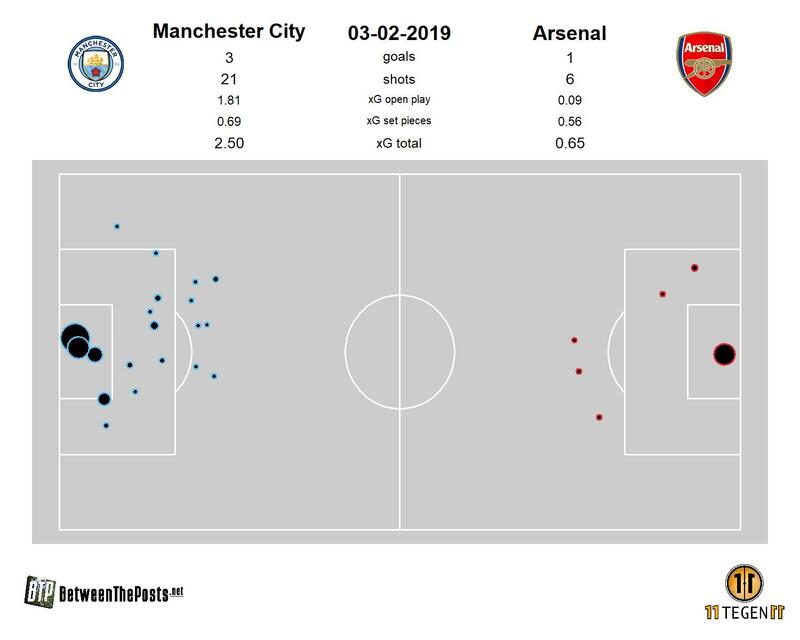 It was City’s turn to make a mess of things near their box and Arsenal got a corner. Lucas Torreira’s delivery was perfect and Nacho Monreal flicked a header into the path of goal scorer Koscielny. The game was rather uneventful until the 44th minute, when City’s players finally figured out how to exploit Arsenal’s defensive shape. Fernandinho got on the ball, roved forward, and played a switch pass into Raheem Sterling. A classy one-two with Gündoğan soon ensued before Sterling knocked a square pass to Agüero for the tap-in. Having found the way to beat Arsenal, City shifted their approach to quick side-to-side play in the second half. As a result, Arsenal’s defensive structure began to be dragged out of shape, allowing City’s cleverer players to operate in more room. De Bruyne was the biggest beneficiary, as he hung around the edge of the box and forced Bernd Leno into three good saves. That could very well have been the way City found their third, but instead, they sealed the game in the way they had scored their second. A switch of play found Sterling on the left, who dribbled past two players and bounced the ball off Agüero and into the net. 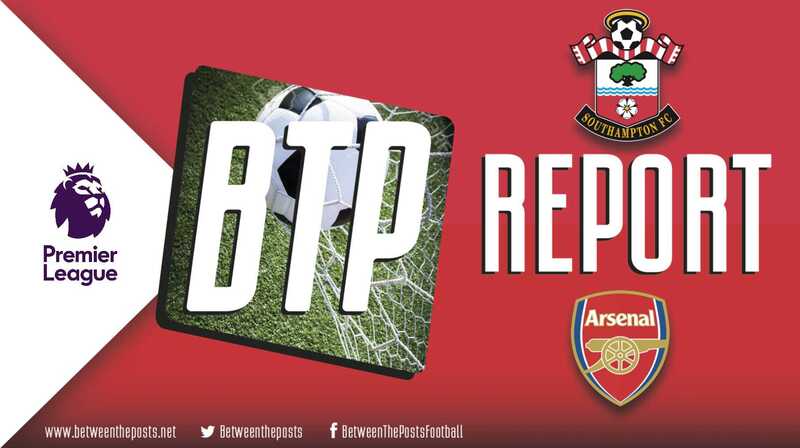 Arsenal, who had no choice but to attack, attempted to build more structured attacks. 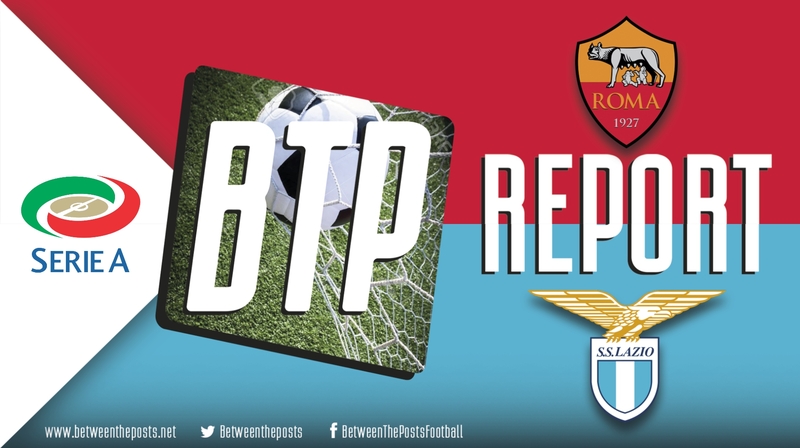 City reacted with the high press that had been seen in fits the entire game. 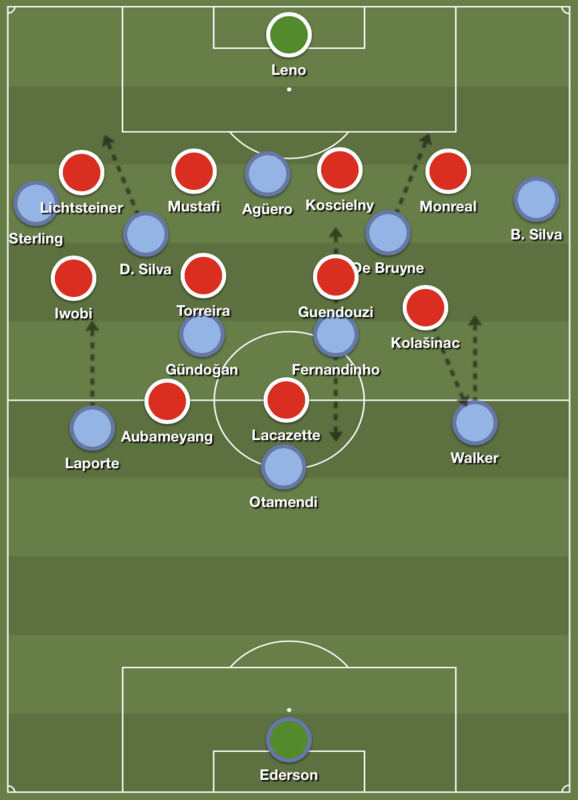 Manchester City’s wing-oriented high press suffocating Arsenal’s buildup. As soon as one of Arsenal’s center backs got on the ball, one of David Silva or De Bruyne would push up to press while cover shadowing When a player is positioning himself between the opponent that has possession of the ball and another opponent, he is blocking the passing lane. When applied the right way, his ‘shadow’ is effectively taking the opponent in his back out of the game, because the pass can not be played. the defensive midfielder they left behind. Agüero would react to this pressing trigger A pressing trigger is a specific pass or movement by the opponent that draws out a coordinated team press. by closing off the channel to the other side of the pitch, effectively forcing Arsenal to pass towards the wing. Once that happened, either Sterling or Bernardo Silva would put the opposition fullback under immense pressure. Emery has often been accused of structuring predictable buildup patterns and it showed. Arsenal, who prefer to play out from the back through simple triangles down the flanks, could find no way out of the press and often had to settle for long balls. They only managed to get into City’s half around the eighty-minute mark, when Pep’s men became more cautious and sought to defend their 3-1 lead. The gain in territory made no difference for Arsenal, however, as they failed to create anything before the full-time whistle blew. The expected goals plot illustrates just how flat Arsenal were after their equalizer. In fact, the visitors did not register a single shot attempt in the second half. It is hard to say whether Pep Guardiola will be happy with his team’s performance or not. Even when City were 3-1 up, he cut a frustrated figure on the sideline, throwing his bottle to the ground on at least one occasion and constantly bellowing at his players to focus. It might seem harsh from Guardiola, but his side were not superb on an individual level. There were numerous instances where City needlessly gave the ball away or played poorly weighted passes. Their win seemed to come from the way their formation outmatched Arsenal’s, rather than through consistently spectacular play. There is no doubt that Emery will be disappointed at what he saw, regardless of the fact that Arsenal were obvious underdogs. His scheme was cut apart rather easily and his predictable buildup patterns played its part in his team’s lack of a comeback. Nevertheless, it is still difficult to decide what to make of Emery, who seems to alternate between puzzling tactical performances and masterclasses like the ones he managed against Chelsea and Tottenham. Use the arrows to scroll through all available match plots. If you like this article, please consider a membership of Between the Posts. This will grant you access to all our coverage of the top five leagues, plus our advanced team stats page. Finally, members are also encouraged to post comments and interact with our writers.